In Tarot 'The World' signifies the end of life's journey. You have experienced what the world has to offer, you are wiser and more learned because of it. With the end of the great cycle of life comes fulfillment, achievement and understanding. Great satisfaction comes with following your path through life and upon completion, this eternal process begins anew. From the earliest surviving Tarot through to popular modern day decks, such as Rider-Waite, the traditional imagery of 'The World' is largely unchanged. A dancing figure rejoices, surrounded by a wreath of thick foliage and in each corner a lion, bull, cherub and eagle reside, representing the four fixed signs of the zodiac, the four elements and the four suits of Tarot. The symbolism is complex, representing victory, achievement, infinity but also enlightenment. 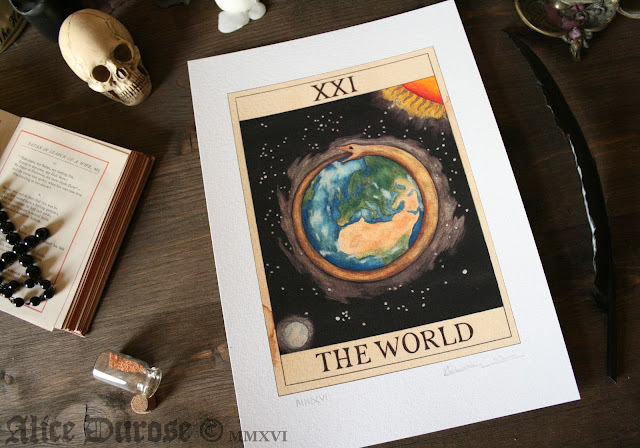 With 'The World' I took a very different approach to the imagery seen in most Tarot decks. I wanted to move away from traditional depictions and re-imagine 'The World', but maintain many of its key messages. I decided a logical option was to depict our world, earth, in its place within the universe, seen not from an insular point of view, but encompassing all. The Earth is surrounded, almost cocooned and protected by Ouroboros - an ancient symbol, usually a snake or dragon eating its own tail. It represents the infinite and continual cycle of nature, of birth and death, of eternal renewal and the constant cycle of life. In my depiction of 'The World' the Ouroboros represents that not only the cycle of life all over the Earth, but across the universe. I chose to include the Sun and the Moon, as the Earths celestial neighbours they are essential to our survival, providing warmth, light, fertility and tides to our planet. They are essential to our balance and place within the universe. 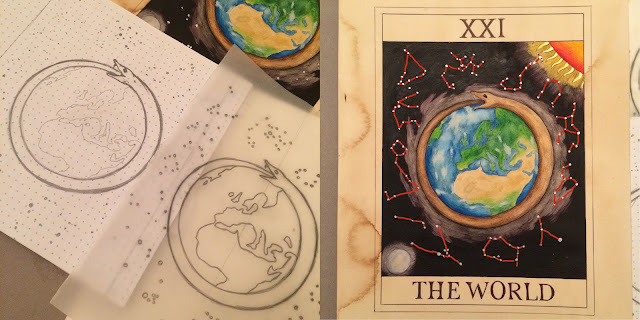 Surrounding the World are the constellations of the 12 signs of the zodiac. They surround the earth, signifying their relationship to the world and life, and the different qualities they bring to the world. The infinite blackness of space is the canvas for our world, often feeling lonely and isolated, but also suggesting that in the infinite vastness of the universe, 'The World' may not be alone. My version of 'The World' was not a difficult creation, mentally wrestled over and struggled with as art works often are. It simply leapt from my mind one day, virtually fully formed, and I had to race to scribble it down before it vanished as quickly as it had arrived. Those are often the artworks which feel most satisfying as an artist. Their creation and conception has felt like an effortless joy, so their completion often feels very rewarding and 'meant to be' in a strangely comforting sense.